actually obtain if they voted for the right candidate - 46 Big Benefits. What you can do, as one of my campaign assistants, to put your State government back in the hands of people who are fed up with New York's and the country's current direction. As a voter you make a big mistake in casting your vote for one of two hardly distinguishable candidates based on a single issue that allows one candidate to distinguish himself/herself from the other. You are causing a loss of the candidate who is offering you (as in my case) 46 highly desirable programs that could and would be made available to you. You may think that voting for a third party or third-party candidate would cause a loss of your vote, but the reverse is generally true. When voting for one or the other of the main candidates, you are voting for nothing, except a guaranteed continuation of the destruction of the American way of life, the American economy, your economic well-being, the jobs and opportunities you and your family need to be able to live your life in the way you have planned -- and you are asking or pleading with the winning (Republican or Democratic) party to turn even more of your assets, opportunity, well-being and future to the world's major corporations, for their benefit and your loss. Wake up! Learn what's happening and vote in favor of yourself for a change. With that as an introduction, and to get it off my chest, here are the things that I can do for you, if elected as New York State Attorney General, things which should have been done by prior Attorneys General, but could not be done because everything to be done for your benefit will come out of the pocket of major corporations and backers of the two major parties. I want you to see the issues as I developed them from the heart and head, based on what I think I can do for voters, and without reference to the platform or campaign promises of any other candidate. I pride myself in being original, and this I can assure you is what you will see below, with the added original feature that by and large the points can all be accomplished by an elected Attorney General. The reason that an appointed Attorney General could not be guaranteed to do these things is that the appointed Attorney General has no power, and is really an agent and mouthpiece for the elected official (i.e., the President or a Governor in about 13 states). There is an additional important point. Because of the selection of federal judges who can be expected to rule in favor of big business and against consumers, resort to the federal courts is becoming far less of an option for aggrieved American citizens, and the pendulum has swung to voter action in the marketplace rather than trying to seek relief in the biennial (every 2nd year) and quadrennial (every 4th year) national elections rigged in favor of big business. Based on these successes, Eliot Spitzer clearly (as it seemed to me) was going to be making a bid for higher office, which to my mind at the time meant one of the following: U.S. President, U.S. Vice President, U.S. Senator (from NY) or Governor of NY. It was no surprise to me that Spitzer became a runaway shoo-in for Governor of New York, which appears to be a stepping stone to run for the Presidency of the United States. 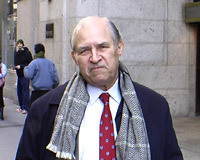 Upon my analysis, however, I see that Mr. Spitzer is voluntarily vacating the 2nd most powerful political office in the United States (if not world), in exchange for a lesser office (NYS Governor), but an office which is considered by most voters to be far more important than NYS Attorney General. I don't want to pick any fights with my Green-Party candidate for Governor, about which office is more powerful. The important thing is that the Green-Party Governor and I working together with the power of both offices, the winners will be the residents and small businesses of New York State, and the losers will be the multinational corporations which are going to see a reduction of their profitability in New York State because the I and the rest of the GREEN TEAM are going to make sure that the multinationals obey the law. This means, for example, an end to outsourcing of your jobs to other countries without appropriate review and penalties; no more fraudulent practices to steal money from New Yorkers; no more monopolistic practices by major retailers to drive competing businesses out of business and eliminate the higher-paying jobs and related small-business opportunities. There is much, much more. Just read the issues above to see what I mean. A Governor who appoints the State Attorney General would have the power of the Attorney General, and if New York did not elect its Attorney General the Governor would have the power of both offices. But, New York is one of 37 states in which the Attorney General is elected, which gives the Attorney General the independence and authority under law to do what the Attorney General decides to do and not what anyone requires the Attorney General to do. Of course, the NYS Attorney General does not tell the Governor what programs the Governor should push or not push. At best, the NY Attorney General would advise the Governor on legal options or what activities the law seems to prohibit, and the Governor then does what he/she wants to do, and goes back to voters in due course for approval or disapproval. Having two powerful positions (Governor and Attorney General) can and should work to the advantage of New Yorkers, especially when the two office-holders are offering themselves to voters as a team. In Presidential elections, the Vice President (as the 2nd elected executive) is often nominated to appease a warring faction of the party and has little hope to participate meaningfully in absence of a total transfer of power to the Vice President, such as with the transfer from John F. Kennedy to Lyndon B. Johnson. When the Governor appoints the Attorney General, the potential of the attorney filling that role is compromised and weakened, because the decisions are made by the Governor [and the Governor's team], usually not a lawyer, and certainly not as well versed in what is possible legally as the Attorney General himself/herself. Thus, the Attorney General in such a situation becomes an advisor and advocate and wholly subsumed under the personality, programs and staff of the Governor, which you know from experience is advocacy of more legislative rather than what can be done without new legislation. The two major parties receive hundreds of millions of dollars from major corporations and through free publicity from the major media that are owned by major corporations. You, as voters, do not learn much if anything about minor parties. They are funded with amounts so small that a single taxicab driver in New York City takes in more money per week than almost any of the minority parties in New York State. With no funding, there is no advertising, and you are not going to learn what you need to know to make a correct decision. Accordingly, you vote for Tweedle-dum (Republican) or Tweedle-dee (Democratic) and many of you aren't firmly convinced that you are voting for the right candidate or party. We can change the predictable result (that Tweedle#1 or Tweedle#2 is the winner) by having volunteers communicate with people they know, and others, to get them to register as voters, hopefully to designate the Green Party, and to obtain information about the 2006 election from Carl E. Person, the other Green-Party Candidates, the NYS Green Party and their respective websites and campaign material. Become a part of our campaign to restore New York to its prior greatness, and to push back the destructive forces of the current political leaders who are allowing, even encouraging, the destruction of the American economy and your chances to achieve the American Dream. Join with us. We need your help. Because we are such a small organization, you immediately become an important member of our team. This could be one of the most important decisions you ever made, and it certainly will change your life by what you will learn about politics, and the way in which politics is being run today to benefit the wealthy corporations and impoverish the voters and destroy many of the nation's small businesses. The United States government is being run by and for the benefit of the world's largest corporations, whose interests are, understandably, squeezing every last penny they can from every country that permits themselves to be squeezed. The major media are owned by major corporations and (with some notable exceptions such as CNN's Lou Dobbs) are unwilling, understandably, to reveal to the public why jobs are leaving the country and why Americans are working harder for less money. The answer is simple enough. The United States is not enforcing its laws regulating business against the major corporations of the world, with the result that they are stealing the American economy under the noses of the American people, with the government and media telling the public that what is happening is inevitable; that America is better off having most of its work being done in other countries because this leaves America with the higher-paying jobs of creating new products for other countries to manufacture. Of course, this is all nonsense. Without having jobs in the United States we are unable to pay the rents and mortgages based on higher land values that exist in the United States than in India or China; the higher costs of maintaining the nation's armed forces that are used to secure (or perhaps steal) markets in other countries for the world's major corporations that avoid paying taxes to the United States; this means that United States citizens are paying for the protection and expansion of the corporate interests that are depriving Americans of their American way of life. The answer, as you might well expect, is not in trying to win back control of the United States government once out of every two or four years. This was tried several times without success. The money available to do that is not being made available to the third parties, and the two major parties are part of the problem. We have come to the point where it makes no difference, as a practical matter, whether a voter votes Republican or Democrat. For example, Democratic President Bill Clinton did more damage to the country than most recent presidents with NAFTA and related legislation assisting major corporations in moving their operations to other countries, and destroy America's job base as a result. The answer clearly is to have state and local governments start enforcing the laws that are no longer being enforced by the U.S. government against major corporations. New York State Attorney General Eliot Spitzer started doing this, and achieved enough success with his limited efforts (limited basically to a handful of fraudulent practices of major financial institutions) and this daring and narrow law-enforcement effort against a handful of large corporations catapulted Spitzer into his candidacy for Governor of New York, with the next step obviously being his candidacy for the U.S. Presidency. Spitzer has shown us the way, but when you analyze what Spitzer has done and what he hasn't done you come to a quick conclusion that Spitzer carefully avoided going after any of the main problems facing New Yorkers. Look at my list of 43 issues to see what Spitzer has not done, but could have done if he had so desired. State and local government is the only place where realistic law enforcement against major corporations can still take place. The nation has 50 states, 100 major cities, and 18,500 towns and villages, and a large number of counties, all of which have the right to protect themselves by bringing suit against major corporations that have hurt these governmental subdivisions and their residents in violation of existing federal and state law. This is what the elected attorney general can and should do in New York: Identify and describe the areas of wrongdoing by major corporations and commence appropriate action. In addition, the New York State Attorney General should extend his/her statewide power into every one of the State's 1,800 towns and villages by helping these towns and villages create and use a new political office, that of the "Town Attorney General", to enforce federal and state laws against major corporations for the benefit of the local residents and small businesses, to have the greatest impact for New Yorkers and the nation. See my ideas for the Town Attorney General at my website Town Attorney General Website. The centralization of law enforcement activities in the hands of a single appointed United States Attorney General has enabled antitrust law enforcement at the federal level to come to a complete stop. The same is true at the New York State level under Eliot Spitzer. This ability to prevent antitrust law enforcement through two elected officials (the first being the President of the United States, and the second being the elected New York State Attorney General) can be overcome by creating 1,800 little attorneys general in the 1,800 towns and villages in New York State, each town and village acting in its own best interest and at times, if necessary, even suing the State or another town or village that is doing something in violation of law to injure such town or village. Imagine the potential for law enforcement against major corporations if we expand the decision makers from two persons to 1,800 (in New York) or 18,500 (in all of the towns and villages in the United States). This would be an army of civil prosecutors more powerful than the army of criminal prosecutors that have wound up putting the nation's voters in jail to a greater extent (by percentage) than any other country in the world, without having much of an impact on the continuing violation of law by the major corporations doing business in the United States. Now is your chance to do something about stopping the dismantling and destruction of the United States. Help the Green Party save New York by getting registered to vote as a Geen Party member, by forwarding some of my issues to interested friends, relatives and associates (using the convenient button located at the top and bottom of each issue description) and by volunteering to help me in my campaign. I invite you to call me so we can discuss what you can do. My office telephone number is 212-307-4444.